I own a very old fashion scientific calculator and it can’t solve any simultaneous equations like those new calculators (not even 2×2!). The situation goes worst when I try to do my Circuit Theory tutorial, in which I need to solve many simultaneous equations. Can’t I just concentrate on forming the equations and let someone to solve them for me? Well! Let the Python do it! All you have to do is forming the proper equations. Then, fire up the following script. 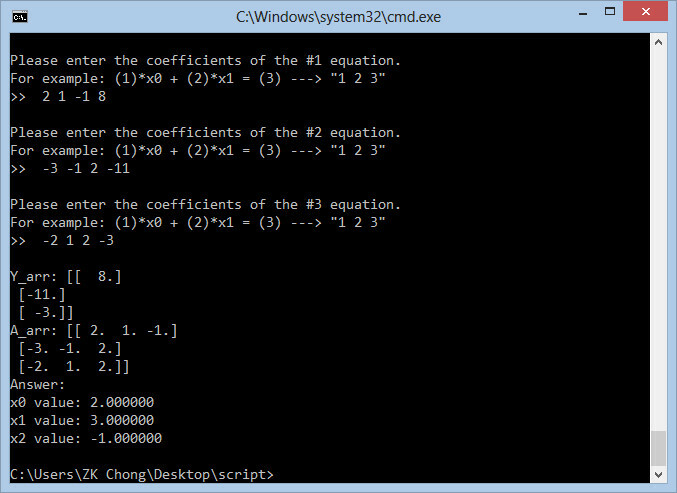 Key in the proper coefficients of each equation when Python asks. Please feel free to copy and use it anywhere you like. # Given A and Y, we need to find X.